NEW YORK TIMES BESTSELLER • NAMED ONE OF THE TEN BEST BOOKS OF THE YEAR BY SAN FRANCISCO CHRONICLE, USA TODAY, AND CHICAGO TRIBUNE • A masterly work of literary journalism about a senseless murder, a relentless detective, and the great plague of homicide in AmericaNATIONAL BOOK CRITICS CIRCLE AWARD FINALIST • NAMED ONE OF THE BEST BOOKS OF THE YEAR BY The New York Times Book Review • The Washington Post • The Boston Globe • The Economist • The Globe and Mail • BookPage • Kirkus Reviews On a warm spring evening in South Los Angeles, a young man is shot and killed on a sidewalk minutes away from his home, one of the thousands of black Americans murdered that year. His assailant runs down the street, jumps into an SUV, and vanishes, hoping to join the scores of killers in American cities who are never arrested for their crimes. But as soon as the case is assigned to Detective John Skaggs, the odds shift. Here is the kaleidoscopic story of the quintessential, but mostly ignored, American murder—a “ghettoside” killing, one young black man slaying another—and a brilliant and driven cadre of detectives whose creed is to pursue justice for forgotten victims at all costs. 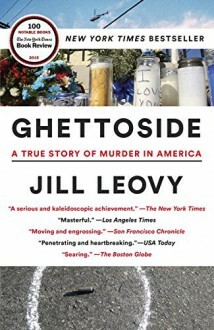 Ghettoside is a fast-paced narrative of a devastating crime, an intimate portrait of detectives and a community bonded in tragedy, and a surprising new lens into the great subject of why murder happens in our cities—and how the epidemic of killings might yet be stopped. Praise for Ghettoside“A serious and kaleidoscopic achievement . . . [Jill Leovy is] a crisp writer with a crisp mind and the ability to boil entire skies of information into hard journalistic rain.”—Dwight Garner, The New York Times“Masterful . . . gritty reporting that matches the police work behind it.”—Los Angeles Times“Moving and engrossing.”—San Francisco Chronicle“Penetrating and heartbreaking . . . Ghettoside points out how relatively little America has cared even as recently as the last decade about the value of young black men’s lives.”—USA Today“Functions both as a snappy police procedural and—more significantly—as a searing indictment of legal neglect . . . Leovy’s powerful testimony demands respectful attention.”—The Boston Globe“Gritty, heart-wrenching . . . Everyone needs to read this book.”—Michael Connelly “Ghettoside is remarkable: a deep anatomy of lawlessness.”—Atul Gawande, author of Being Mortal“[Leovy writes] with grace and artistry, and controlled—but bone-deep—outrage in her new book. . . . The most important book about urban violence in a generation.”—The Washington Post “Riveting . . . This timely book could not be more important.”—Associated Press“Leovy’s relentless reporting has produced a book packed with valuable, hard-won insights—and it serves as a crucial, 366-page reminder that ‘black lives matter.’ ”—The New York Times Book Review“A compelling analysis of the factors behind the epidemic of black-on-black homicide . . . an important book, which deserves a wide audience.”—Hari Kunzru, The GuardianFrom the Hardcover edition.